Westosha Central senior Becca Edwards, who plans to play at Division 1 UW-Green Bay, leads a strong core of returners for the Falcons (File Photo/The Report). Boasting seven returning letter winners, including three all-Southern Lakes Conference performers, the Westosha Central High School softball team looks to stay in the hunt for a conference title. Staying in the hunt, however, will depend on how well the nine newcomers adjust to varsity game. A year ago, the Falcons, who finished third in conference play at 10-4, reached the sectional final for the seventh consecutive season. But, the Falcons lost to Burlington 5-3 to end their season 20-9 overall. While Burlington lost some of its talent – like Jaina Westphal and Josie Klein – the Falcons bring back seniors Becca Edwards and Olivia Kazumura along with junior Carli Odejewski. Edwards, a first team all-state and all-conference, finished her junior season with 43 hits, 40 RBIs, six home runs and batted .494. She committed to play at Division 1 University of Wisconsin-Green Bay. Kazumura, the team’s top pitcher, was named second team all-conference after she struck out 146 hitters, produced a 1.82 ERA and logged 13 complete games to finish 15-4 as a junior. Additionally, Kazumura produced at the plate, collecting 24 hits and batting .328. “At the end of last season she was nearly unhittable,” Lampe said. For Odejewski, named second team all-conference as a sophomore, she batted .413 with 27 runs scored, 33 RBIs along with 11 stolen bases. The left-handed Odejewski, according to Lampe, brings both power and speed to the top of the order. “She is a true power-slapper with tremendous speed. She was also the starting center fielder last season and should anchor a solid outfield again this season,” Lampe said. Senior Molly Grabarac, another letterwinner, played outfield last season. She has spent time at first base in early season practices. Grabarac stole eight bases and scored 12 runs as a junior. “(Molly) is a solid contact hitter with very good speed with great plate discipline,” Lampe said. 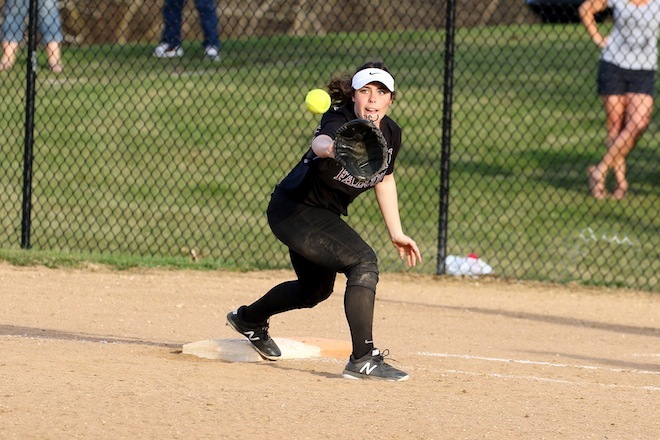 Ellie Christeson, a junior outfielder/pitcher, presented both power and speed in limited action in 2018. While she went 5-3 in the pitcher’s circle, she scored 22 runs and stole eight bases. Infielder Dana Herman, Lampe said, was a pleasant surprise last season as a junior after she started the year on the bench. “Dana will continue to play infield and will be a key member of our offense,” he added. Abby Jones, a senior infielder, played a pivotal role as a pinch runner with nine stolen bases is the other returning letter winner. The Falcons, meanwhile, will need to replace graduated seniors Kayla Kerkman, Andrea Edquist, Danielle Gulliford, Kendall Krumm, Rylee Johnson and Alex Kelly. Kerkman, WisSports.net’s top senior middle infielder, plays at Division 2 Winona State University while Edquist contributes at the University of Wisconsin-Platteville. Defensively, junior Janell Gillmore could fill one of the middle infield positions, according to Lampe. Behind the plate, where Edquist played, Lampe is looking at two sophomores with different strengths. While Jillian Adams brings power and a strong arm, Lampe said, Olivia Nahorniak presents speed. Junior Kenna Beth, another newcomer, could share some of the catching duties. Other newcomers are juniors Megan and Ellie Witt, Madison Garcia, Grace Anderson and sophomore Carly Vogelsang. “We have a lot of new faces this season. How quickly they adjust to varsity softball will be a key,” said Lampe. Entering conference play, Lampe sees Wilmot, Burlington and Elkhorn as Westosha Central’s toughest competition.